The last word in Jubilee bunting can now be viewed on the South Bank. 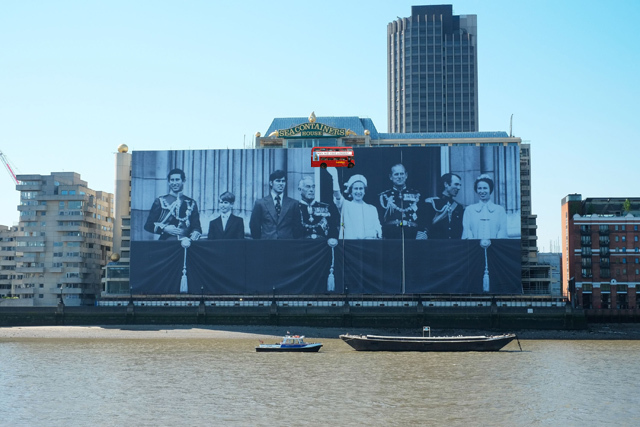 This colossal banner of the Royal Family currently dangles from Sea Containers House, next to Blackfriars Bridge. The bus isn't really there. We've added it to give a sense of scale. The banner, reminiscent of Pyongyang leader worship, will grace/blight the south bank until the end of June. At 100 metres wide and 70 metres tall, it shows the queen approximately 43 times her usual height. It's like something from the nightmares of David Icke. Don't worry about the poor office workers whose views have been sheathed. The building is currently empty and undergoing redevelopment. To balance out this blatant bit of Royalism, we invite our more mischievous readers to take an image of the banner and use Photoshop or similar to give it a bit of a touch-up (if we dare use that phrase in front of Her Majesty). Here's a version without the bus. Send your best efforts to hello@londonist.com.